During AFCON 2013 in South Africa, I met a visiting Moroccan fan after Bafana played them in Durban and we exchanged numbers. He invited me to his country in 2015 to watch the next edition of the championships. That was before Ebola. Way before Ebola. Ebola came and though it seems to have later disappeared, it was too late – Morocco had freaked out and opted not to host the tournament. CAF responded by kicking them out but Equatorial Guinea saved the day, volunteering to help CAF by hosting the event (a favor to be later repaid). This was an unpredictable tournament. Along Eq. Guinea (ranked 32), 15 of the top 17 ranked teams in Africa competed and in an ironic twist, Eq. Guinea’s group featured the 3 least-ranked teams. To be fair, that could be the luck of the draw but it raised a few eyebrows, not least those of vocal (by twitter standards) journalist Neal Collins. Eq. Guinea somehow escaped that group behind Congo with 2 draws and a last-game win against Gabon. Tunisia and DRC made it through from Group B, while Ghana and pre-tournament favourites Algeria were 1st and 2nd in the group of death, Group C. Bafana had a disappointing tournament (given their preceding form) but their group was undoubtedly the hardest. If Group C was hard, then Group D was the tightest. 5 of the 6 games ended in 1-1 draws, with Drogba-less Ivory Coast’s win over Cameroon making them first among equals. Mali & Guinea drew 1-1 and had to be separated by drawing of lots. The good: The goal celebrations. Some were good. The bad: Mali & Guinea being separated by the drawing of lots. A dance-off would have been better. The ugly: The goal celebrations. Some were awful. Onto the quarter finals then; first up was a Congo derby (DRC v Congo) which had me searching the net to find the difference between the two countries? Yep, they are different. DRC (country population 62 million) came back from two goals down to beat Congo (Pop. 4 million) by four goals to two. From the game with the most goals to one with most controversy: Tunisia v Eq. Guinea. Tunisia led 1-0 and they should have won the game with more goals before the late drama. 90+2 mins: EQ. Guinea player dives to win the cheapest penalty I’ve ever seen. Shocker. 100 mins: Guy named Balboa goes down easily for a foul just outside the box. 101 mins: same Balboa scores a rather great free kick. 120 mins: Ref gives 2 injury minutes after Eq. Guinea wasted more than 5 minutes in the 2nd half of extra time alone. Ghana beat Guinea 3-0 while Ivory Coast overcame Algeria 3-1 in the other two games. The same score lines were repeated in the semis as Ghana beat Eq. Guinea 3-0 & CIV beat DRC 3-1. The good: 6 goal thriller in the DRC v Congo match. Rumble in the jungle etc. The bad: The Eq. Guinea/Tunisia was the most baffling officiating I’ve ever seen. The ugly: Tunisian players. Though understandably hurt, they did not need to chase down the ref after the game. CAF later fined the Tunisian FA $50k. Two of the best African teams in the last decade met on Sunday night at the Estadio de Bata, in a repeat of the AFCON 1992 final. Many people thought the final was boring, but I thought it was a good game. Not great, but good. Most finals are cagey anyway, and it was 0-0 after 120 minutes with Christian Atsu of Ghana striking the post in the 1st half. The penalty shootout provided more drama. The Black Stars of Ghana went into a 2-0 lead as the Elephants missed their first two kicks. The second was missed by Tallo (a 120th minute sub), brought on especially for penalty kicks. Bummer. The teams went into sudden death tied on 3-3. The next 5 kickers for both sides all scored, leaving the keepers to decide their nations’ fate at 8-8. Barry saved from the Ghana keeper, before getting up to score the winner. Orange was the new champion. 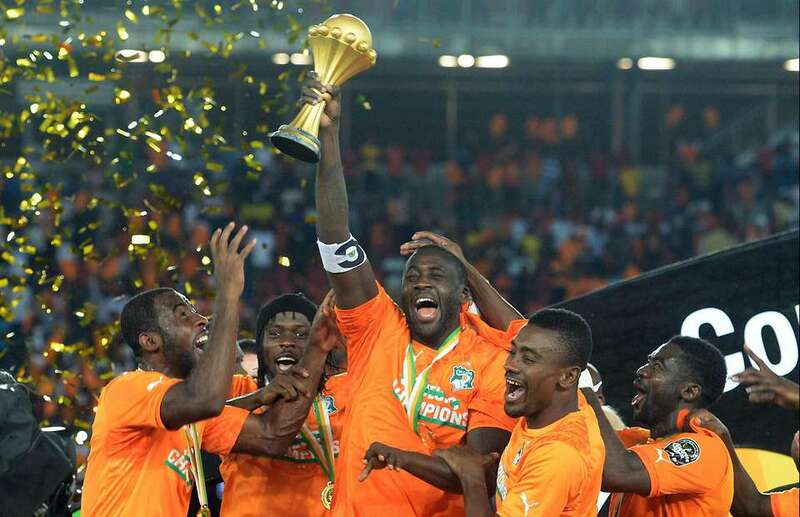 The good: The ‘Golden Generation’ of Ivory Coast finally won a trophy. The bad: Stadium was half-empty. The ugly: Nothing ugly really, quite enjoyed the final. The next tournament was supposed to be hosted in Libya. But we know Libya is far from friendly. In fact, there is ongoing war in Libya. As it stands, the 2017 hosts are yet to be confirmed. Fancy Equatorial Guinea to volunteer again. Haha,wherever it turns out to be, they will play. And we will just write. A drama in 5 acts – the story of World Cup 2014.